Landing at Panama City airport (Tocumen International) let you immediately get into the panamanian mood where the contradictions are more than a way of living. When I was informed about our day trip in San Blas, I thought about some beaches, sand, palm and blue sea. Not that I was against things like that, but maybe the idea to wake up at 5 wasn’t really my cup of tea on holiday. 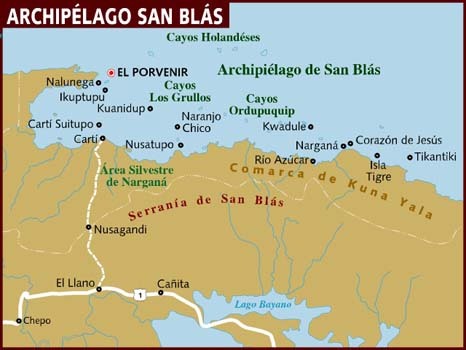 Anyway I started to look for some information about the place and i found that San Blas Islands is an archipelago with approximately 378 islands, most of them not inhabited. Seriously? 378 islands are not very easy to figure. Bocas del Toro is the perfect destination where to spend a weekend surfing, snorkeling, or just have a break sailing around the amazing islands of the archipelago. It is a province of Panama with a mainland and nine main islands. The capital is the city of Bocas del Toro on Isla Colón part of the Bocas del Toro Archipelago, in the Caribean sea and about 80 km to Costa Rica (so you can easily find taxis or boats available to bring you across the border). The Panama Canal connects the Atlantic Ocean to the Pacific Ocean in just 77 km.